This excellent non-greasy, pleasant smelling ear cleaner is for routine cleaning and odor control of the ear canal. 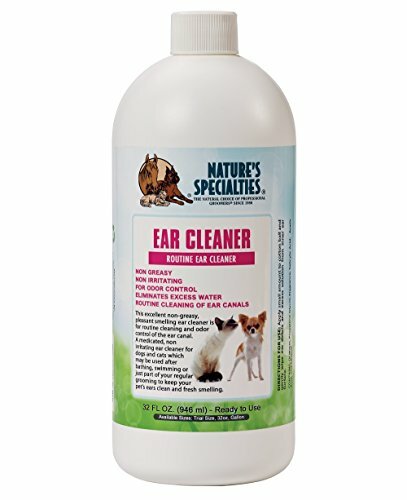 A medicated, nonirritating ear cleaner for dogs and cats which may be used after bathing, swimming or just part of your regular grooming to keep your pets ears clean and fresh smelling. Contains a water scavenger to help eliminate water in the ear canal yet won't dry out the ear itself. Safe on dogs,cats,kittens,puppies,pets and small animals. Contains: Deionized Water, propylen glycol, glycerine, fragrance, salicylic acid, PEG 75 lanolin oil, lidocaine, boric acid, acetic acid, ethinal.